Who wants to play 'let's pretend this post was up on Monday and not Wednesday'? When I do a post about a layering combo, I'm never sure what order to use for the photos. In this case I'm so nuts over the end result that it goes first! I might have to do a full mani of this sometime, I love it that much. ...but wait...there's more! It's got a secret! 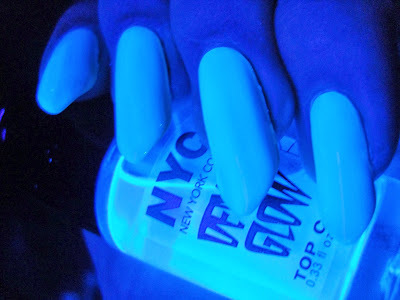 Somehow I found myself with a couple of bottles of NYC Demon Glow, a UV reactive top coat, before I had a blacklight bulb. 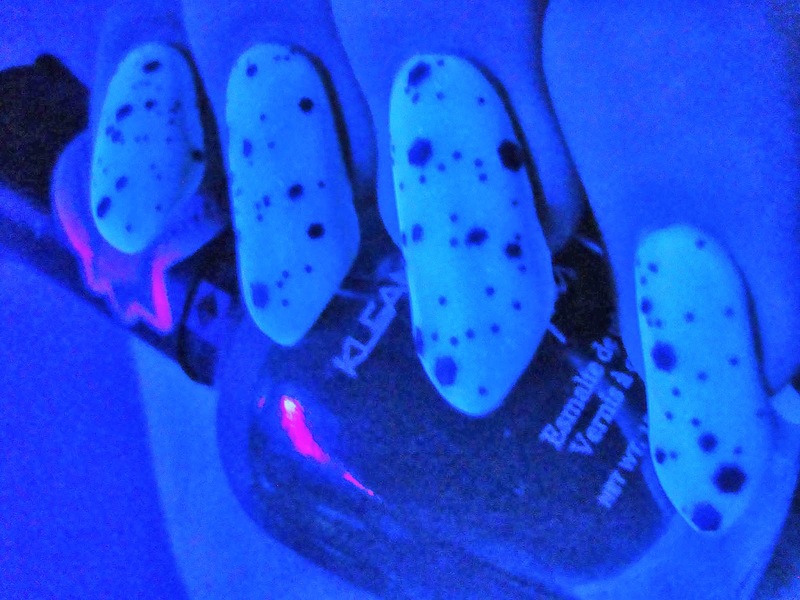 They were twin packed at Dollar Tree with a white shimmer called Lazy Sundae that I love for stamping. 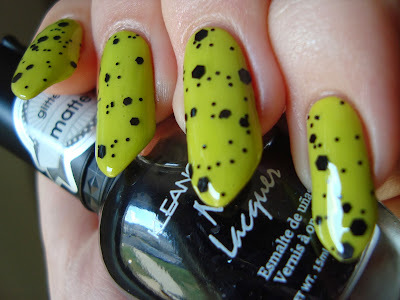 I loved what starlet10799 on the MUA Nail Board did with it last year, but I don't have any Halloween stamping plates. I'd been trying to figure out what to do with Demon Glow when I suddenly remembered the black glitter waiting in my swatching bin. It worked even better than I'd hoped it would! 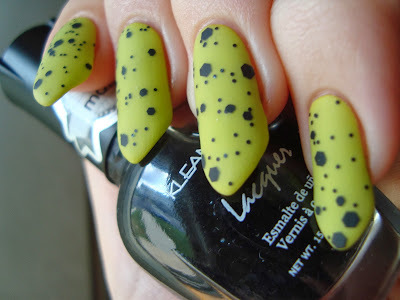 Color Club Sunrise Canyon is a chartreuse cream. I am in complete awe of this garish, absurd color! Wow! It's like CoverGirl Appletini tilted a bit more toward yellow for even more impact. I wouldn't have gone anywhere near it a year ago and I was kinda unsure about it right up until I put it on. I got it in one of those packs from Ross, the whole Fiesta collection. The set was worth it for the two I knew I wanted, Wild Cactus and Endless Summer, so this was a great bonus. I think Nichole will be getting Flamingo (if she wants it), but I'm not sure what I'll do with On The Rocks and Mamba yet. As for the formula on Sunrise Canyon, it's on the watery side, but workable. This is three coats. I had only a few small bubbles, but they were "deep", going all the way through the color like a tunnel. You'd never really notice though, with such a bold color. If I was a normal person, I'd probably live in this color for a while, I love it that much. As is, who knows when I'll wear it again...but I really want to! NYC Demon Glow is a clear UV-reactive top coat. I was worried that Demon Glow would alter the base color, but it really didn't. Yay! This is two coats of Demon Glow over Sunrise Canyon, because one coat went on a little patchy. This was easily the weirdest cleanup I've ever done. 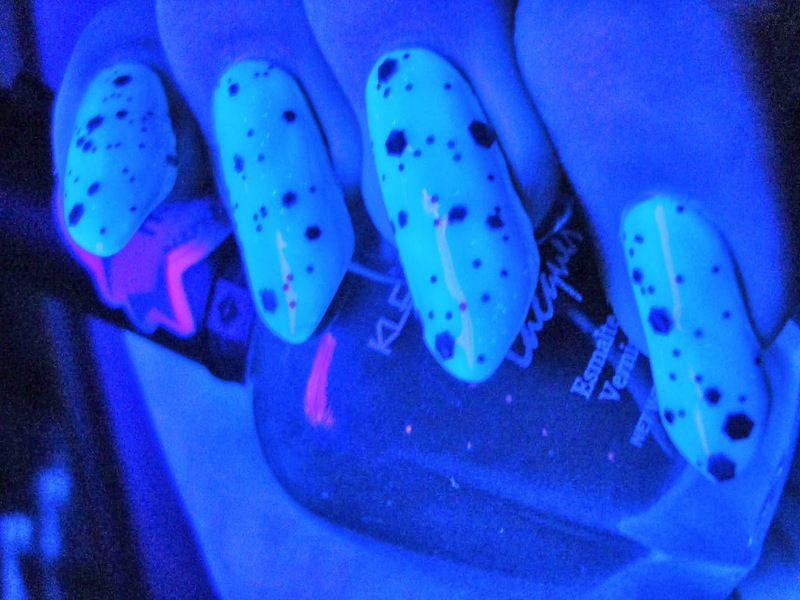 To make sure I got as much of it off of my skin as I could, I had to clean up under blacklight while standing in my bathroom. I chased little glowing streaks and spots around for ages and I think I got most of it. The glow blows me away! KleanColor Beyond Time & Space has three sizes of matte black glitter in a base that dries matte. A bit, but it does still glow. It's at its brightest when it's the top layer, but the glow is still there even under a whole bunch of coats of other stuff. Yay! So yeah... It is actually Wednesday. I've had the flu all week, so I'm catching up and I'll be sneaking this week's posts in where they should have been. See you at weird, random times and Happy (very nearly) Halloween!